So, where are we going, hoomin? Bunlandia? ... the Great Republic of Dandelia?? Or did you have other plans? Did you? Well, Pipkin, there are so many wonderful places to choose from. What about the Bunn Canyon? Big Bunn? The Grand Bunntons? Cape Bunn? Bunnsacola? The Bunnsey Shore? Old Bunnful? 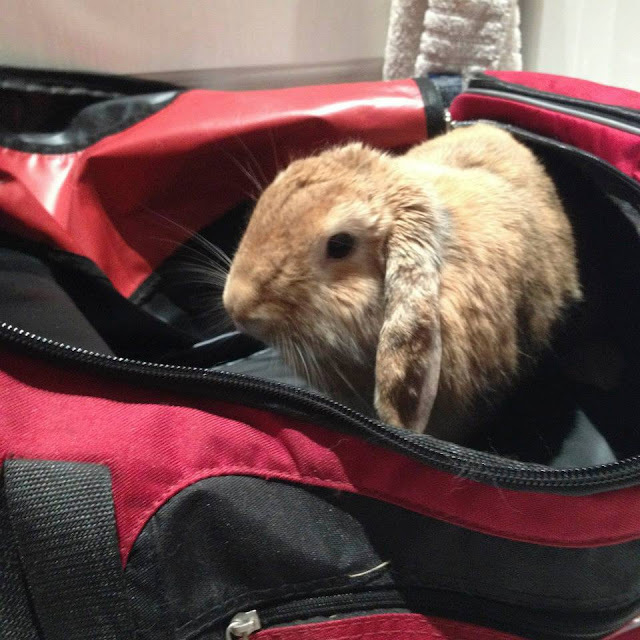 Bunn Voyage, little one! If you pack really light you won't absolutely HAVE to take Chris. Have a bunnderful time! (Just so long as it's not to the V.E.T. or the Isle of the Shedding Brush). Well, you certainly couldn't bring yourself to remove Pipkin from the bag and leave all by yourself, could you?